A (literally) rose-tinted Imax feature about the history of transportation and how it led to air travel, and how air travel now impacts us all, Living in the Age of Airplanes – directed by Brian J. Terwilliger, narrated by Harrison Ford and released by National Geographic – has been praised for its stunning imagery, but as is inevitably the way with these things, not so much for having any great depth. 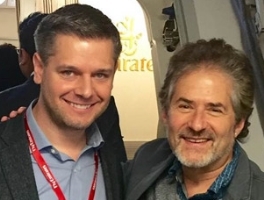 Terwilliger probably didn’t have to think too hard about who he wanted to score his film – James Horner’s love of all things aviation was well-known and he worked on a number of projects in recent years in which he was able to musically express his passion for it. Of course, it is also what tragically cost him his life in 2015 and this album’s release concludes what has felt like a long goodbye from the great composer as his final works have been released in the time since. It’s a fitting conclusion to that journey, really – to the James Horner journey that so many of his fans have lived through for several decades – because it’s such a positive, joyful work, the film’s uncritical eye allowing the composer to express himself without any need to add any edge or to hold himself back. It does mean there isn’t often any great sense of drama here – and that’s quite an omission given how key it usually was to his best works – but get caught up in the enthusiasm of it all and I have to say it’s hard to escape its spell. The “Opening Sequence” introduces us to the main theme, a wordless male voice soon joined by others, a vague African tint to the sound (and also perhaps a dash of Titanic) before the orchestra swells and the choir becomes celebratory. Expect the piece to show up in numerous trailers in the years to come. The second piece “The World Before the Airplane” opens with a brief burst of the same theme, on flute this time, before something a lot less expected takes over, which is the sound of Thomas Newman. It doesn’t even really sound like James Horner doing an impression of Thomas Newman, it just sounds like Thomas Newman – the marimba, guitar, the elegant strings – it’s very nice, but stylistically certainly not expected. “200,000 Year Timeline” begins with a lovely piano solo before the orchestra swells again in a great statement of theme, all sweeping and majestic, the finest moment coming when horns herald the piece’s grandest segment. A modern, pulsing beat is added to “History of Transportation”, the unmistakable sound of the Horner brass accompanied by the driving rhythm, a series of great melodic leaps presumably signifying great leaps forward. This sequence culminates in the exceptional “Nearly Perfected”, the album’s most dramatic piece, which just gets bigger and bigger, the powerful version of the main theme that emerges from a beautifully swelling little figure near the end of the cue surely enough to send a shiver down anyone’s spine, especially (obviously) any lover of the music of James Horner. After that excitement, the composer dials things back a notch in the brief “Portal to the Planet”, which opens with some lovely romantic music led by piano before another of the score’s more unexpected features emerges, a little electronic figure that sounds like the sort of thing you’d have heard at Epcot in 1986 as a vision of what the music of the future would have sounded like (and in fact, evidently it does). “Migration Vacation” will bring a smile to the face of many, a groan from others, because it’s a (very) thinly-disguised variation on the choral music heard in Avatar, specifically the “Climbing up Iknimaya – the Path to Heaven” sequence, mixed in with a bit of “Jake’s First Flight” – quite glorious! “Ancient Civilisations” returns to more deeply explore the style of early in “200,000 Year Timeline” and “Portal to the Planet”, getting somewhat similar to the typical “natural world” sound we heard so often from him, but with a more romantic tinge. After that, Thomas Newman’s back in “Maldives” (it’s like a soft-focus version of American Beauty) before some very satisfyingly pure, unadulterated Horner magic in “Antarctica”, which is grand and majestic and really very beautiful. “Flowers” is completely different (underscoring the literal rose tint I mentioned earlier, as flowers picked in Kenya are followed to their destinations around the world) – a kind of big band salsa music, it’s very nice in its way but rather at odds with everything else. We’re back on track in some style in “Exponential Progress”, which will join the earlier “Nearly Perfected” on a huge number of James Horner playlists around the world: a new theme is introduced, one of tangible hope and optimism, at first on piano before the orchestral sections gradually join. There’s so much in it that I love – it’s so breezy, so light, so beautifully arranged – and it’s got a great tune. It’s one of those pieces I could put on repeat and listen to over and over. The delicate “Perspective” is one of those pieces where Horner keeps tugging away at the emotions and if you haven’t given in during the series of variations on a simple motif from the piano and strings, you surely will when the subtle choir starts cooing towards the end. “The Golden Age is Now” then returns us to the vocal style of the earlier moments in the score, keyboards and drumkit adding a pop instrumental feel to the world music singing – but the orchestra’s there too, adding an inspirational sound. It’s a bit corny – OK, it’s extremely corny – but not for the first time I find myself unable to resist its enthusiasm. A brief reprise of the main theme (choral again) is presented in “Home” before the end title piece rounds things up with yet another variation. There are a couple of “remixes” to close the album – a slightly less pop-infused version of “The Golden Age is Now” and then an extended version of the end titles piece. As I said at the opening, this is not a score of great dramatic depth but rather an unabashed celebration of joy and positivity. A bit schmaltzy? You bet, and I love it for it. As far as rapturous musical treatments of flying go, I’d take the composer’s Flight any day, but there is nothing on this album that I don’t like and wouldn’t happily listen to time and time again. It’s surprising to hear how much here is genuinely different from pretty much anything else I can think of by the composer (along with – of course – some more familiar moments) – but it’s not surprising to hear his spirit shining through every last bar. It’s a lovely album and – while I’m sure there will be some further James Horner treasures unearthed in future – for now it serves as a very fitting send-off. Still hard to believe he’s gone. Horner was one of my idols growing up. Great review, though! This was one of my two most anticipated documentary scores of the year (the other being Hanz Zimmer’s Planet Earth II, which I think comes out in a little over a week). It’ll be interesting to see how Zimmer follows up on the beautiful original soundtrack. It is a really wonderful score! Horner sounds here fresh and new. A lot of the music is diffrent from all other Horner scores. He was in 2014 and 2015 full of ideas. Southpaw, Wolf Totem, Pas De Deux, Collage, The 33, Airplanes and his ideas for The Magnificent Seven were all diffrent and very good. His last compositions are showing, that he was one of the very best, for me the best composer along with Jerry Goldsmith and John Williams. Somehow I refrained from buying the download and waited for a CD album release. And waited. And waited. And now- its here! Thanks to Intrada, this soundtrack has finally been given the physical release I craved and I must say it sounds quite wonderful. And it is really such a special bittersweet joy hearing something ‘new’ by James Horner. It sounds fresh but also so very ‘Horner’, an almost painful reminder of what we have lost with his passing a few years ago. I agree with you how overwhelmingly joyful and positive and rather cathartic this music is.